This 5 string bass guitar features a spruce top, quilted maple back and sides. The neck is maple with a maple fretboard. The body is 17” with a 34” scale length. The tailpiece, bridge, pickguard, and headstock are curly maple. It has one Benedetto S7 humbucker pickup and sounds great acoustically or electrically. 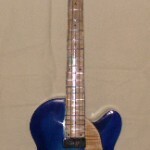 This entry was posted in Bass Guitars by JakeS. Bookmark the permalink.